smpa = findStructuralProperties(structuralmodel.MaterialProperties,RegionType,RegionID) returns the structural material properties assigned to the specified region. Structural properties include the Young's modulus, Poisson's ratio, and mass density of the material. Find Young's modulus and Poisson's ratio for cells of a 3-D geometry. 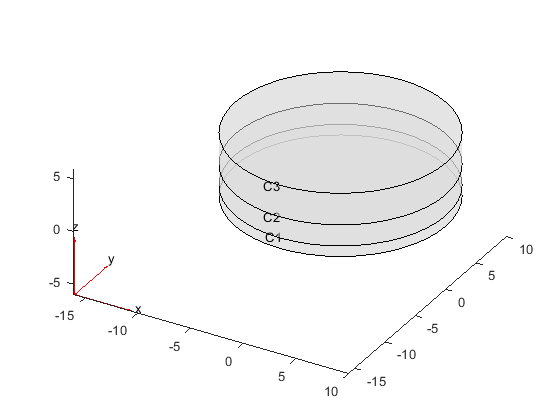 Create the geometry consisting of three stacked cylinders and include it in the model. Plot the geometry. Assign different values of the Young's modulus and Poisson's ratio to each cell. Check the structural properties specification for cell 1. Check the structural properties specification for cells 2 and 3. Material properties of the model, specified as the MaterialProperties property of a StructuralModel object. Material properties assignment, returned as a StructuralMaterialAssignment object. For details, see StructuralMaterialAssignment Properties.